This past summer, when so many folks were anxiously waiting for the release of The Hangover Part II, a little, unheralded movie came along and pretty much stomped it into the ground. Let's face it--Bridesmaids was funnier, more disgusting (if that's a good thing), and touchingly bittersweet. But the best part of it all was the scene stealing performance of Melissa McCarthy, who became an overnight sensation in the wake of the film's success. I got to see a little scene stealing of my own in Easton, Maryland recently. Now, Amanda Anderson, who married Matt McNally on an absolutely beautiful day last month on the Eastern Shore, didn't actually have any bridesmaids, so you might think it odd for me to even bring this up. These guys weren't into first dances and cake cuttings and all of the "normal" trappings of weddings that can get a bit formulaic. 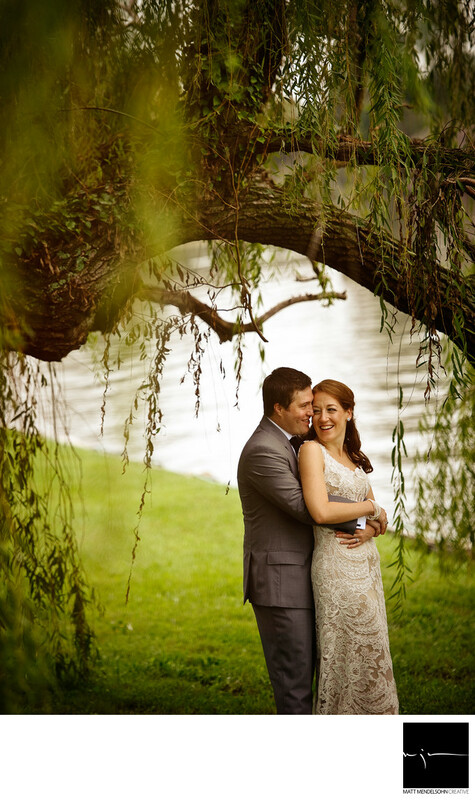 They wanted a relaxed Chesapeake wedding and that's what they got. The bay was spectacular, the sunset was amazing and the lemonade was perfect. Now, I'll admit to tearing up at a few weddings over the years but I can't remember laughing as hard as I did right then. The scene in Bridesmaids with the bad Mexican food? This was funnier and more unexpected. Though it may seem like a silly gag, it was a breath of fresh air.